“ “After multiple strokes, Mom is in a 'Memory Care' Unit. This puzzle walks you through assembly with color coded sections. 'Tray' shows selections by color outlines. Once easy version is mastered, puzzle can be put together without the 'cheater tray'. Comes in a zip pouch for storage. There is a descriptive paragraph on each bird. Great for conversation and added mental stimulation. The last sentence is key and serves as a reminder that with the right puzzle, putting it together is only the beginning. Many people miss the opportunity to use the puzzle as a starting point for interesting and stimulating discussion and reminiscing. They concentrate on putting the puzzle together, and miss out on the chance to engage the person even further. If the person talks about the image while putting the puzzle together, encourage the conversation and follow their lead. Once the puzzle is finished, a good way to start (or continue) the discussion is to ask the person to point to the area of the puzzle that immediately attracts their attention. Make a general observation about that item and encourage them to elaborate - if they point to a bird, for example, you might say that it’s a pretty color and wait for them to comment. If they don’t - ask them a question about the bird - “Do you like the color of the bird?”, “Have you seen this bird from your window?”. When they seem to be finished with that item, ask them what else they noticed in the image and repeat the process. Ask the person leading questions about the image - “Will you find the wreath in the picture?”, “Where is the cat?”, then talk about the item. Reminisce about related experiences that the person may have had - “What were your chores on the farm?”, “Do you go to the candy store?”, “Did you have a favorite pet?”. Use your knowledge of the person’s interests to focus the discussion. Each time you do the puzzle, expand on the areas that seem to be of the most interest to the person. Follow the person’s lead and prompt them with new questions when needed to keep the conversation flowing. You will be amazed at where the conversation goes. It is important to keep in mind that the purpose of the discussion is to encourage the person to tell their stories and memories, not for you to tell yours. It is all too easy to get caught up in the moment and talk about your experiences but the key to success is to lead the person to talk about theirs. When asking questions, keep in mind that some are more difficult than others - in general, the more abstract the question, the more difficult it is for the person. Questions with a specific answer - "Do you see a ...?" Either/or questions - "Is that a ... or a ...?" Questions with the answer included - "Do you think that is a ...?" Questions with no "right" answer - "What is your favorite part of the image?" Questions that require some interpretation, but do not rely on memory such as "What time of day do you think it is? ", "What season do you think it is?" Questions that require some thought - "What do you think ... is used for?" Questions that involve counting or reading - "How many ... do you see? ", "What does it say on the sign?" Questions that involve "declarative" memory (memory of facts and events) such as - "Have you ever been to ...? ", "Did you have a ... ? ", "Have you ever done ...?" Easy - "Do you think that bell is used to call people in to the house?" Medium - "What do you think the bell is for?" Hard - "Did you ever use a bell to call people?" Choosing an appropriate puzzle image is an important part of being able to have a successful discussion. For people in early stages of dementia, introducing new and “exotic” topics can spark their interest and encourage them to participate. People in mid-stage will find it easier to engage when the image topic is familiar and has the potential to trigger automatic responses. For example, it could be great fun to pursue a conversation about the appearance, characteristics and habitat of an ostrich or zebra in a puzzle image with someone in the early stages of dementia, but it may be more difficult to engage someone in later stages. A puzzle image with a more familiar bird, such as a crow or a blue jay will be more easily recognized and the person would be more likely to participate. 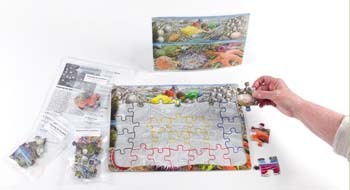 Another consideration when choosing a puzzle for discussion is to ensure that the complexity of the image is appropriate. 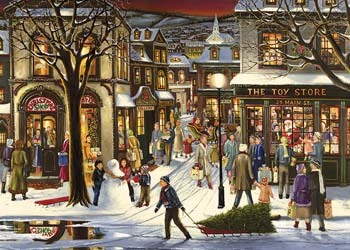 For someone in early stages of dementia a cluttered image with lots going on, such as our Downtown Christmas puzzle, has lots of different things to find in the picture and talk about. For someone in later stages it may be too complex for them to pick out individual parts to talk about. A more appropriate puzzle would have less going on in the image, such as our Chickadee Duo, which is brightly colored but has only two birds and a lilac bush. 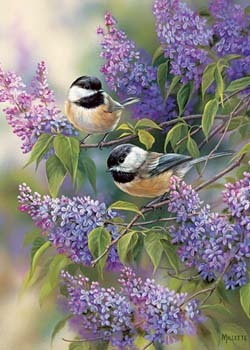 Conversation about the scent of lilac, chickadees flying around the garden and chirping away are likely to flow easily.